MoonSharp is meant to support multiple platforms. It can’t choose which platforms it will run on, as that’s the choice of the end user of the library, so it has somehow to be able to run, say, as a daemon in Linux, as a WPF application, as an app on a mobile phone or a game on a console. For example, APIs as simple as a humble FileStream are not available on Windows Store Apps. Also, MoonSharp doesn’t know how it’s supposed to run and work on the app using it. For example, what if you want loadfile to load from embedded resources instead ? Note that usually script loaders are independent from platform accessors, although they can use their method if they want. This just to say that if, for example, your platform accessor does not support loading from file, it doesn’t necessarily mean that your script loader can’t and viceversa. They are two separate objects because they handle two different responsibilities. A script loader is responsible for how scripts are loaded from files. A platform accessor is responsible for how library functions which should call OS APIs (mostly in the ‘os’ and ‘io’ modules) are handled. If running under Unity3D, the default script loader is UnityAssetsScriptLoader over the Assets/Resources/MoonSharp/Scripts path. Files must have .txt extension (Unity is weird). Let’s say we want to have script loaded from embedded resources of the current assembly. There are basically two ways, one local one global. A common need is to change which directories are used by the require function to load modules. Most script loaders extend the ScriptLoaderBase class which exposes a ModulePaths property which contains all the paths that will be checked to load modules. A word of caution. Changing the ModulePaths and/or IgnoreLuaPathGlobal is not enough to “sandbox” which files can be loaded. If you need this, implement a custom script loader. Embedding scripts as resources is easily done. 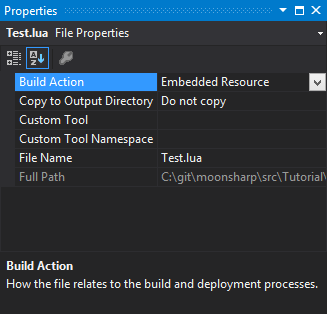 Make sure “Build Action” is “Embedded Resource”. Similar steps can be followed in other IDEs, for example Xamarin. Time to create your own script loader. You have two options basically : extend ScriptLoaderBase (reccommended) or implement IScriptLoader. Both are pretty self-explanatory, but let’s go with the first for the sake of it.